Published on June 10, 2014 in Uncategorized. Closed Tags: amigdaleza, detention, detention conditions, detention duration, greece, new detention regime, prolonged detention. “Are you kidding?” I ask the director of the detention centre Amigdaleza with a feeling of indignation and despair when he describes us how normal the centre is functioning despite “individual” problems. How ‘individual’ are the problems? Hearing for example that you will be held there over 18 months, for “indefinite” periods (following the opinion of the Legal Council of State, which was issued upon request of Mr. Dendias). Young people, who have nothing to do all day, who are detained just because they have no papers, indefinite detainees. And they get crazy! So when there are riots, hunger strikes, suicide attempts, let us not wonder why, let’s not be surprised. The causes, if we want to close our eyes, we know already. Published on June 9, 2014 in Uncategorized. 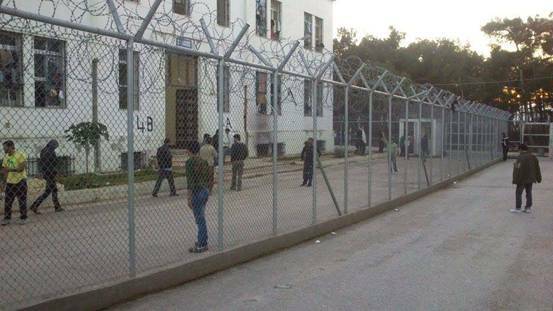 Closed Tags: call for solidarity, corinth, detention, detention conditions, detention duration, detention law, greece, letter, new detention regime, prolonged detention, struggles and resistance. Published on May 17, 2014 in Uncategorized. Closed Tags: age-assessment, asylum, communication, detention, detention conditions, first reception service, GCR, greece, MSS v Greece and Belgium, new asylum service, new detention regime. Published on May 9, 2014 in Uncategorized. Closed Tags: detention, detention conditions, detention duration, greece, letter. The public order minister has been urged to “immediately withdraw” a decision he signed in February that empowers the authorities to prolong the detention of migrants indefinitely, beyond the 18-month limit set down in European Union directives, if they don’t agree to their “voluntary departure” from Greece. Published on May 8, 2014 in Uncategorized. Closed Tags: aitima, detention, detention conditions, detention duration, ecre, European Commission, GCR, greece, letter, new detention regime. Such practice, as well as the Ministerial decision, as far as it endorses the Legal Opinion is in clear violation of Article 15(6) of the EU Returns Directive as interpreted by the Court of Justice of the European Union (CJEU – C-357/09, PPU Said Shamilovich Kadzoev (Huchbarov)). ECRE, GCR and Aitima strongly urge the Commission to raise these concerns with Greece; to call for the immediate withdrawal of the Ministerial Decision insofar as it endorses the illegal practice of detention beyond the maximum period of 18 months as well as any individual decisions taken in violation of the EU Return Directive; and launch an infringement procedure should no immediate action be taken by Greece to stop such breaches of EU law. Published on May 2, 2014 in Uncategorized. 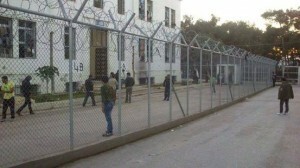 Closed Tags: corinth, detention, detention conditions, greece, new detention regime, suicide. Members of the antiracist initiative of Corinth report that they were not allowed to enter the detention centre as “the was an incident” on May 2nd. Shortly after police cars and fire brigades arrived at the place where a young man was threatening to throw himself from the roof of a building. It was the second time this man tried to commit suicide. He could be finally hindered from jumping after a long period. He was in a miserable state of health as he had also tried to cut his veins being full of blood al over his legs and arms. Published on April 17, 2014 in Uncategorized. Closed Tags: 18 months, detention, detention conditions, European Parliament, greece, new detention regime. Janez Potočnik, Member of the Commission. − Mr President, I would like to answer on behalf of my colleague, Cecilia Malmström, who is unfortunately not able to attend today’s session. The Return Directive provides very clearly that, after 18 months, administrative detention must be stopped and only lesser measures, such as residence restrictions or regular reporting can be applied. In our recent communication on EU return policy, we noted that before the Return Directive was adopted the maximum length of detention varied significantly across Member States and in at least nine there was no upper ceiling on how long returnees could be detained. The Return Directive has contributed to a convergence and overall to the reduction of maximum detention periods across the European Union. While the legal time limits for detention have increased in eight Member States, they have decreased in 12 Member States. All Member States, including Greece, now have legislation in force which respects the maximum periods provided by the directive. The only exception is the United Kingdom, which decided not to opt into the Return Directive and which still allows unlimited detention.